The Alps get all of the attention when it comes to ski holidays in France. But the Pyrenees are serious mountains, stretching for nearly 500 kilometers between France and Spain and rising higher than 3400 meters in elevation. 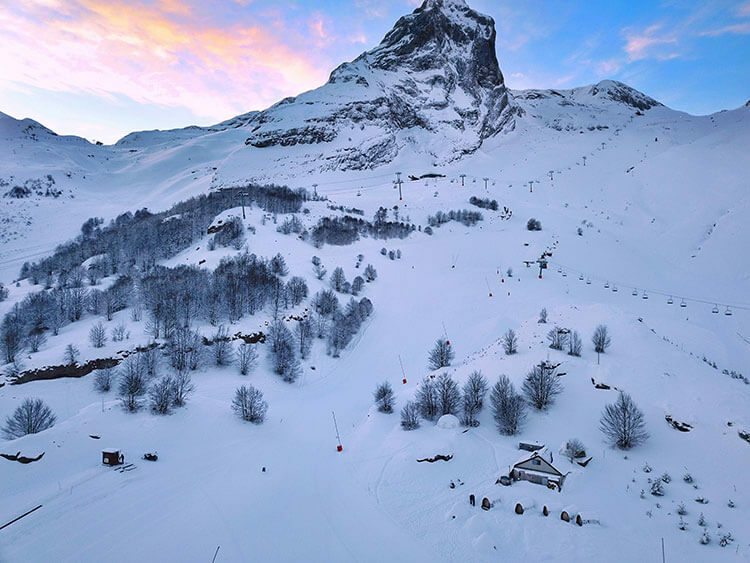 These are the less traveled pistes of France, with skiers and snowboarders here mainly coming from the southwest of France and Spain. UK skiers and boarders, and even Americans traveling abroad for a ski holiday, would be remiss to ignore the Pyrenees. Far less expensive than the big name ski resorts in the Alps, resorts like Gourette are modern and in a spectacular setting. And with early morning flights from London to Lourdes, you can easily be on the slopes by lunchtime. There’s plenty to do for the non-skier too, making Gourette a perfect ski holiday in the French Pyrenees. Gourette is the birthplace of Pyrenean skiing. The first ski lifts in the Pyrenees were installed in Gourette in 1935. And in recent years, a major renovation redesigned and modernized the facilities. 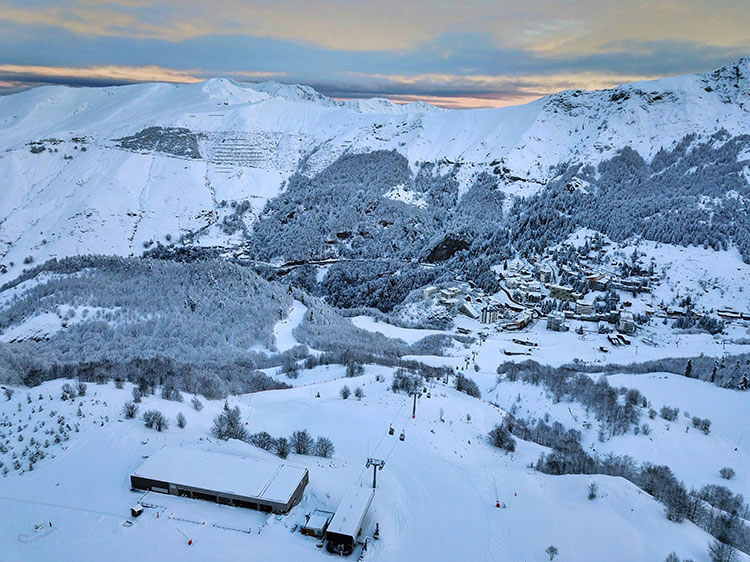 Located in the Pyrenees Atlantiques (one of the three sections of the French Pyreness and located to the West, closest to the Atlantic coast), Gourette’s ski area is dominated by the 2619 meter tall Pic de Ger. There’s 30 kilometers of pistes situated between 1349 meters and 2450 meters, and a good mixture of piste difficulty with 4 greens, 8 blues, 12 reds and a black run. Skiers and boarders won’t want to miss the opportunity to try the 1100 meter descent, which is sure to leave your legs burning. While experienced skiers head to Cotch and Pène-Blanque like Tim did, there’s 14 hectares of easy descents perfect for beginners. There is also a ski school if you always wanted to learn to ski or are a beginner looking to brush up on your skills, and private instruction is available for both kids and adults. If you are traveling on a ski holiday with your kids, there is the Mini Club (open on weekends and during school holidays) where kids from 3 – 12 years old can get group ski instruction, Club Piou Piou where kids from 3 – 5 are supervised by instructors from the ski school and can play or ski for 2 hour sessions, and the nursery welcomes kids from 5 months – 6 years old so parents can have some kid-free ski time. Try as I might with skiing and snowboarding lessons in Italy, France, Switzerland and Montana now, I just have to admit that I’m a terrible skier and an even worse snowboarder. So when we plan our ski holidays, a good mix of other winter sports and things to do is important to keep me occupied while Tim hits the slopes. Gourette offers quite a few things to do right in the ski area, as well as nearby, for the non-skier. While some areas of the ski resort like the Bézou plateau are accessible to non-skiers, other parts like Cotch are only for the skiers. But once the resort closes for the evening, you can hop aboard a special groomer with a 10-passenger cabin for a ride up to the top of Cotch. Going on a groomer tour is like going behind the scenes to see how the groomer gurus work their magic to restore the pistes to pristine condition each night. You’ll see the mountain in a whole different light. Even though Tim took the chair lift up to Cotch and skied down it, he still enjoyed the groomer tour as much as I did. The tour takes about 1 hour and the cabin is heated. There’s also the possibility to drive the groomer and test your skills at navigating these $500,000 snow tractors on the steep slopes while smoothing the piste. You’ll get instruction from an expert groomer driver who rides alongside you. 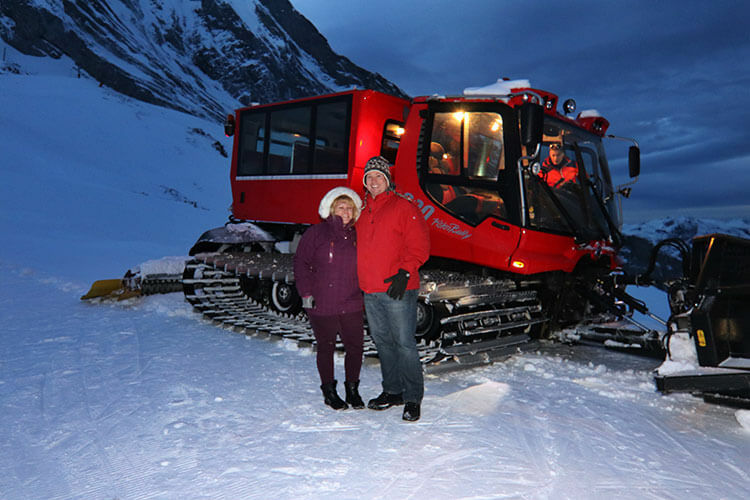 The groomer tour is available nightly and is €27 per person. The drive the groomer experience is available for only one person nightly and is €65. Reservations are required. We love a good zip line, and have never done one over snowy mountains. 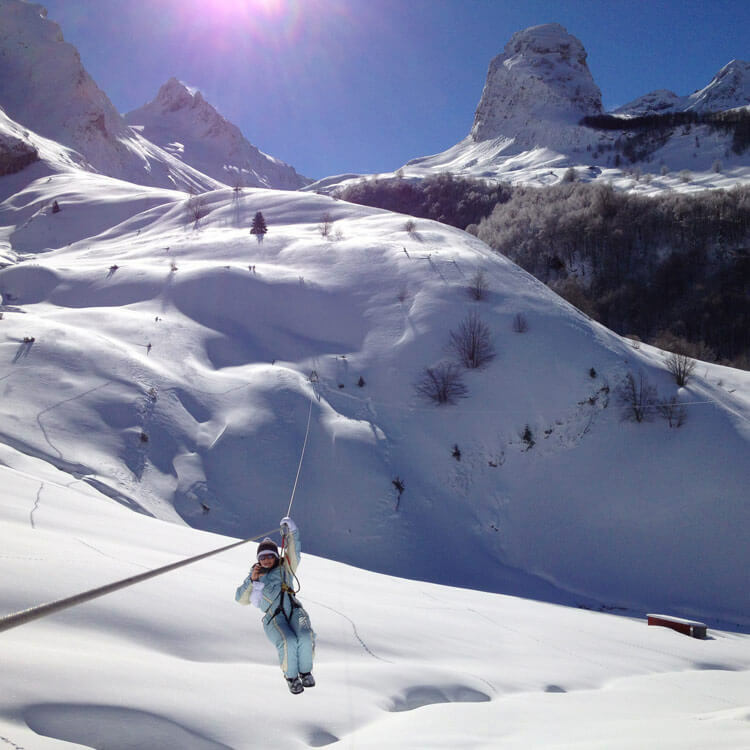 The Grande Tyrolienne is a 200 meter zip line installed between two mountains and is open in both summer and winter. Unfortunately, the morning I was booked to do the Grande Tyrolienne zip line it was a white out. Good for the skiers, but bad for me since my zip line had to be cancelled due to zero visibility. C’est la vie! Grande Tyrolienne requires a reservation and is open to anyone from 5 years of age. €7 per person. Eaux Bonnes, literally meaning good waters, has been known for its therapeutic waters since the 16th century when soldiers wounded at the battle of Pavia in 1525 came here to heal their wounds. The water has chloride and sodium with a high content of silica and sulfide and has been recognized by the High Council of Health for its health benefits. Eaux Bonnes became the place to be after Empress Eugénie, the wife of Napoleon III, made the mountain town close to her native Spain her regular getaway. The Empress’ fondness for Eaux Bonnes led Napoleon to discover it and the other attractions of the French Basque country. ValVital was built right at the source where the natural mineral water bubbles up from a fracture deep in the earth from the fault system that Eaux Bonnes sits on. It’s served as a medical treatment facility to treat respiratory and circulatory diseases, but has recently undergone a major renovation to add a relaxation spa. The entire facility will reopen in 2018. 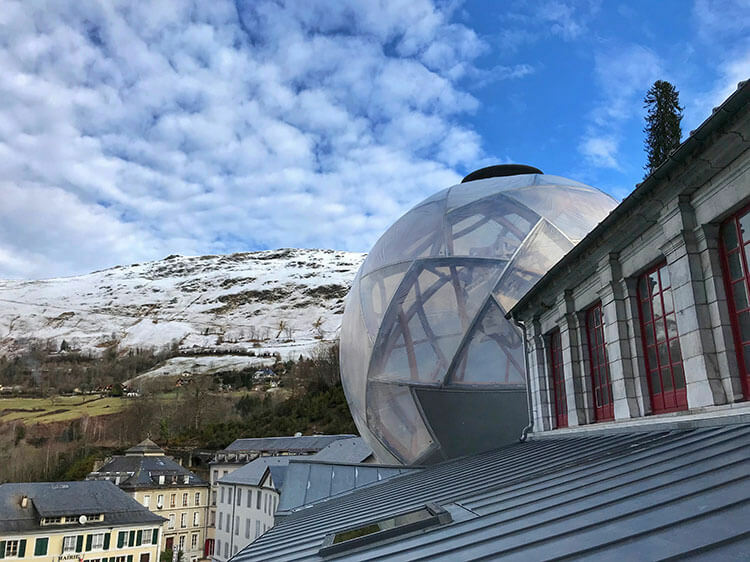 The relaxation spa complex, known as La Bulle des Eaux-Bonnes by the architect Luc Demolombe, will have a suspended swimming pool under the bubble dominating the village of Eaux Bonnes. There’s also a naturally fed thermal pool with 34°C water, a sauna, an amenity pool with hydro-jets, a hamam and a kids play pool. The spa will offer relaxing massages and beauty treatments. It wasn’t open yet during our Gourette ski holiday, but it will be a wonderful amenity just a 15-minute drive from Gourette when it does reopen. We’ll definitely be taking advantage since Gourette will be one of our regular ski resorts since it’s close to our home in Bordeaux. Imagine sleeping at 1600 meters under the shadow of Pic de Ger. All the skiers and snowboarders have gone back down the mountain. It’s just you, the occasional groomer passing by, a million stars and, if you’re lucky, a glimpse of the fox that come out to play on the mountain once everyone has gone home. With a night in the Wild Dôme, you don’t have to imagine it. There’s something magical about the silence of a mountain when all is still. It’s a different world, and an experience not to be missed. The night in the Wild Dôme begins with arrival on the Bézou plateau at the top of the gondola any time from 3pm, but before the gondola stops operating at 5pm. After getting settled in, you can watch the flurry of skiers getting their last runs in for the day with a locally brewed Sarriat or a mug of vin chaud at the Cairn bar. 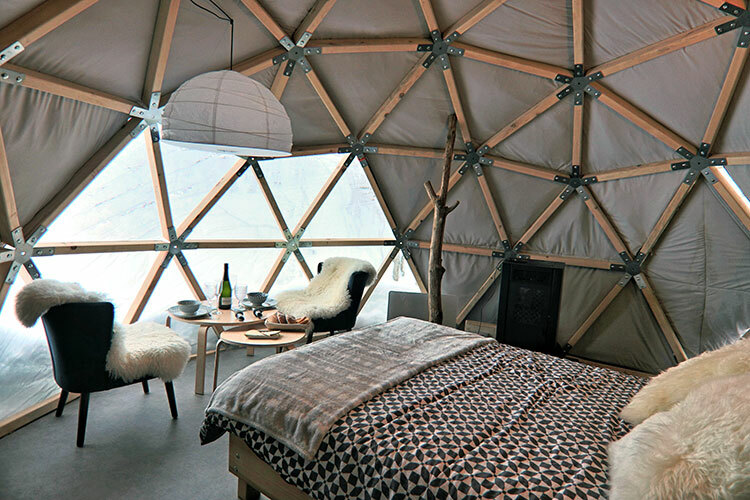 There are two domes, five snow pod cabins and two igloos that you can spend the night in. On our visit, we were lucky to be the only guests – a benefit to going on a ski holiday outside of the Christmas and February school holidays. Once all was quiet and the ski patrols had cleared the mountain, we strapped on snowshoes for a snowshoe hike. The only sound was the crunch of our snowshoes as we weaved through the rocks and trees of the snowy landscape. We hoped to spot one of the fox that sometimes come out on the slopes, but this evening we had no such luck. A toasty jacuzzi awaited us back at the La’venture Nordique base camp, and we eased in to the hot water as snow gently fell from the sky. There’s also a sauna, and if you fancy, plenty of snow to experience the Scandinavian tradition of snow rolling. 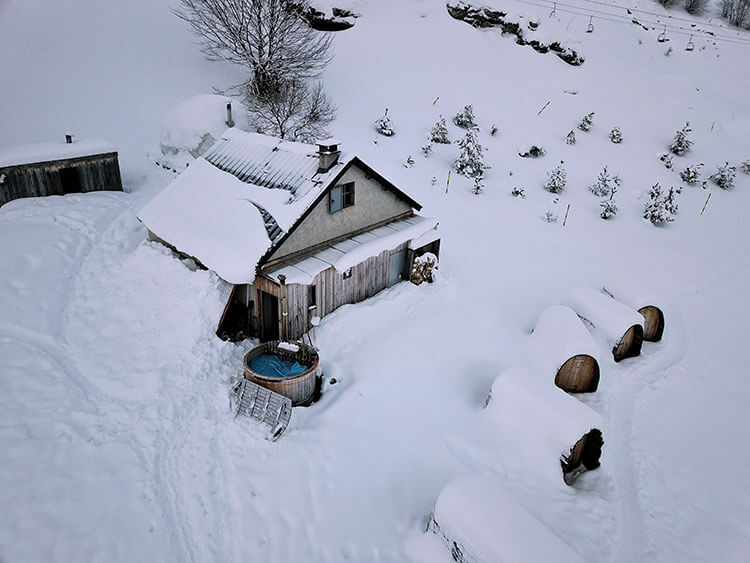 Scandinavians claim you get an incomparable energy boost from rolling in the icy snow after being in a hot jacuzzi or sauna. I left Tim to make snow angels and I’ll take the word of the Scandinavians. We enjoyed champagne, foie gras, cheese from the French Basque country and a traditional garbure – a traditional duck, vegetable and bean soup from the Basque country – for dinner. The dome itself is incredibly comfortable. 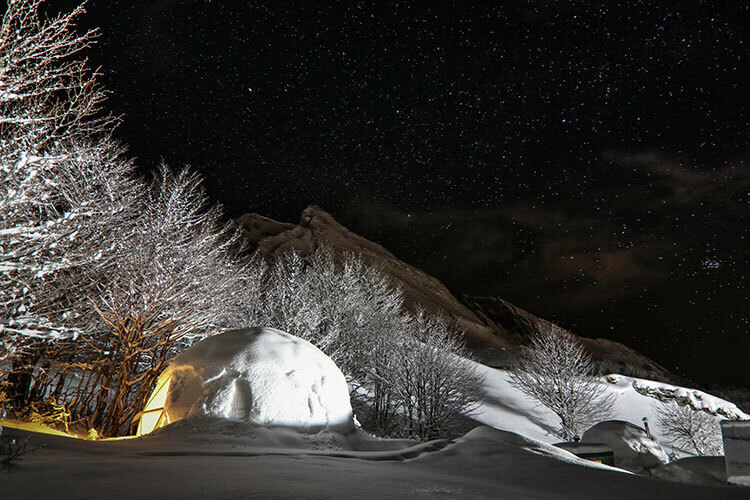 We’ve slept in quite a few igloos, bubbles, snow and ice hotels now and Wild Dôme has been our favorite. It has a full bathroom right inside. The three heaters kept it a very comfortable temperature, and we never actually needed to use the wood stove. There’s also a little kitchenette with a microwave, kettle for tea and a refrigerator. You can even charge up your camera and devices with plenty of outlets available. The only convenience the Wild Dôme lacks is wifi, but then you don’t sleep on a mountain to be connected to the world. I was jolted awake in the middle of the night by the loudest thunder I’ve ever heard. It had snowed snowed several feet over the past 24 hours, and that thunder was actually the controlled detonations to artificially release small avalanches. But had I slept through the night, we might not have seen the crystal clear sky full of a million stars. Breakfast is at your leisure in the morning, since the fixings for it are already in the dome. There’s orange juice, bread with a selection of homemade jams and seasonal fruit. 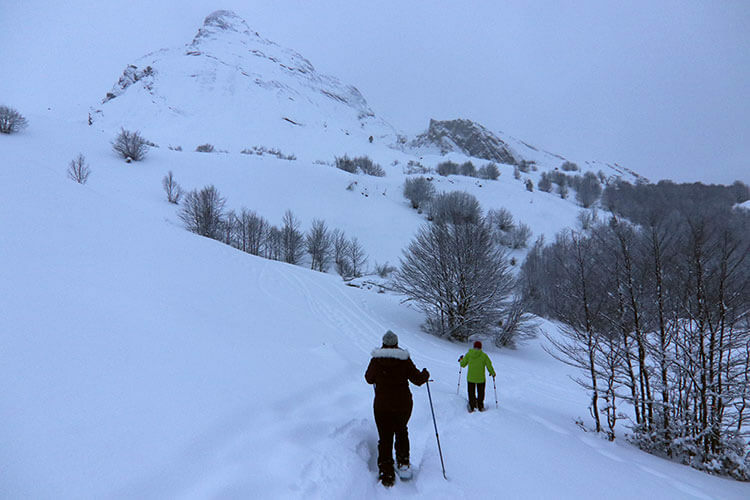 Night in the Wild Dôme is €180 per person and includes the lift ticket, snowshoe hike, dinner, breakfast and overnight. 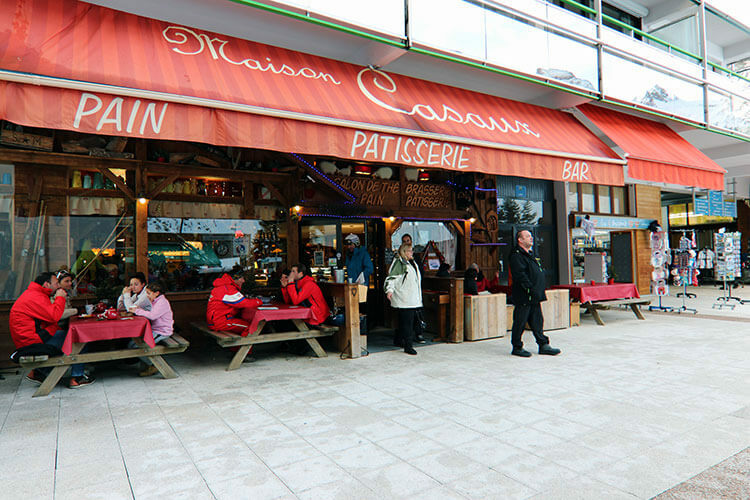 One of the best parts of ski holidays is the food, and the southwest of France is our favorite place to enjoy food in all of France. The people of the Basque Country are called “bon viviant,” meaning living the good life with their beautiful landscapes and excellent fish, meats and cheeses. And best of all, winter sports really work off the rich and fatty foods so you can indulge without any guilt. This Basque dish is typically served as a Basque soup called ttoro, which you’ll especially find around Saint Jean de Luz on the Atlantic Coast. Hake is a deep sea fish from the cod family, with a very mild flavor. 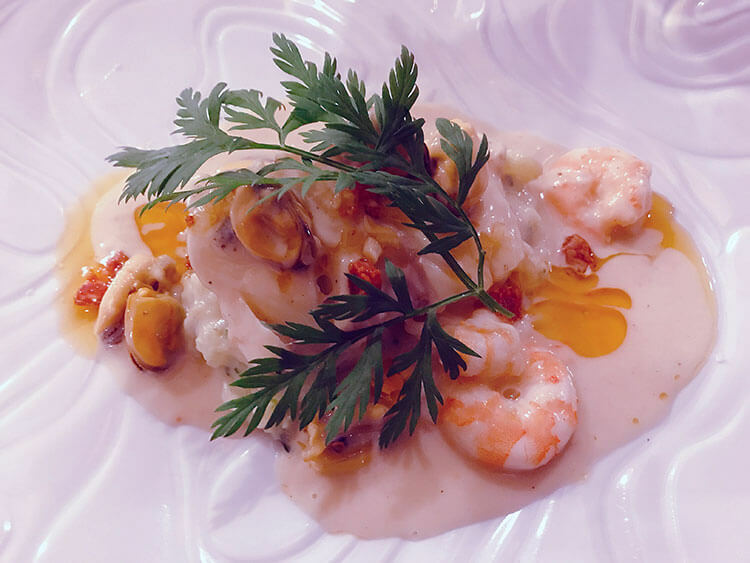 Hôtel L’Amoulat is the best restaurant in Gourette and they re-imagine ttoro as a main dish with the hake topped with the langoustines and mussels and lightly drizzled with a creamy sauce and piment. Let me just say that I’m incredibly picky when it comes to fish, and I’m still dreaming about this one. The AOC protected Piments d’Espelette come from the village of Espelette and the red chili is flavorful and mildly hot. One of the best ways to taste it is in the dish omelette piperade. It’s a dish of scrambled eggs with a kind of salsa of the peppers mixed with tomatoes, onion, garlic and olive oil. Garbure is a traditional soup from the Basque Country and every family has their own recipe. Though it varies a bit depending on who’s making it, the soup always has duck legs, vegetables and beans. Just about everyone knows Prosciutto di Parma and Jamón ibérico, but there’s another cured ham that is just as famous. Jambon de Bayonne is also a PGI product (protected destination of origin) like the cured hams of Italy and Spain, held to high standards that include the breed of pig that the ham comes from, how the pigs feed, and curing and aging processes. Jambon de Bayonne is easy to find, and one of the best ways to enjoy it is on a plancha with cheese from the Pyrenees. The French Pyrenees are known for their cheese producing local fermiers, making delicious Brebis from floral sheep’s milk. Ossau-Iraty Brébis Pyrénées is an AOC cheese, and there are many other types of Brébis. 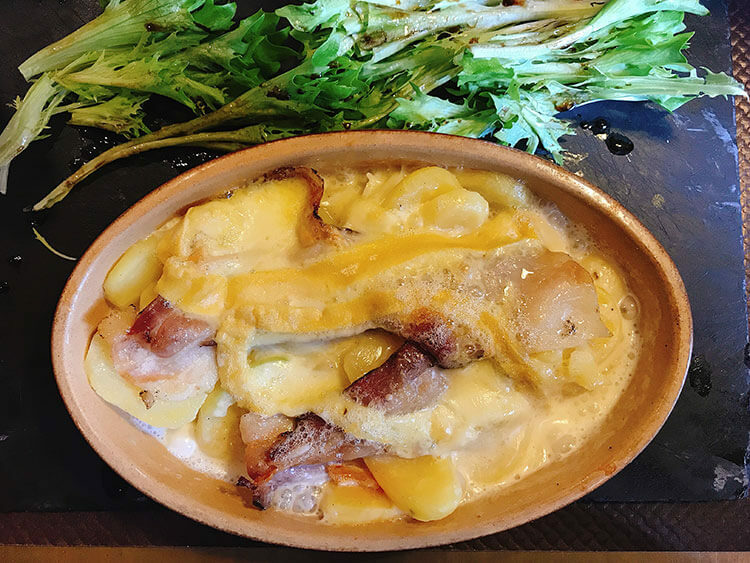 Tartiflette is not a Pyrenean dish – it comes from the Savoy – but it is typically found in ski resorts. 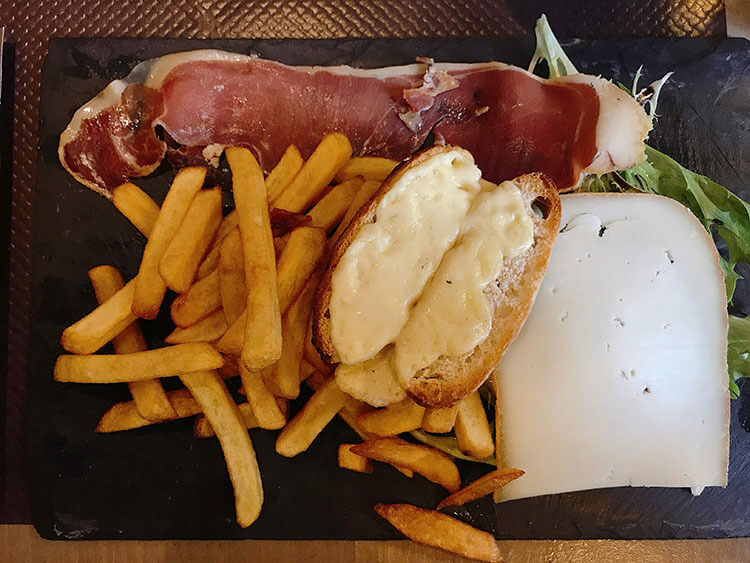 Usually it’s made with reblochon cheese from the savory, but here in the Pyrenees it’s even more delicious with Brébis and Jambon de Bayonne. 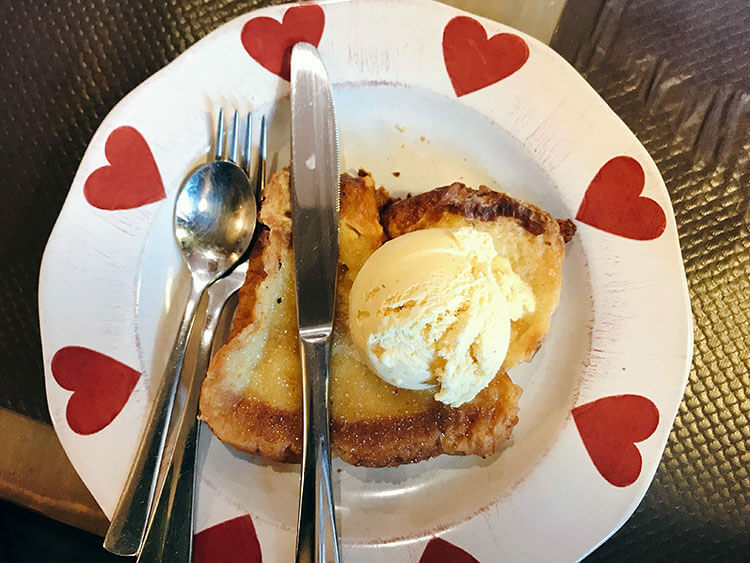 Pain perdu is like a dessert version of our American French Toast, but better – as you would expect in France. The slightly stale brioche bread is soaked in a mixture of eggs, milk, sugar and vanilla, and then pan fried. It’s served topped with some fruit like apples or pears and served with ice cream. Gourette is accessible in about 3 hours by car from Bordeaux or Toulouse. The closest airport is Pau-Pyrenees International Airport or Tarbes–Lourdes–Pyrénées Airport, which is serviced by Ryanair. There is the Line 806 Skibus Pau – Gourette that takes about 1½ hours. Pau is accessible by train from Bordeaux in 2 hours. Hôtel L’Amoulat is in the heart of Gourette, about a 5 minute walk from the gondola lift. The hotel and restaurant is family run and the building is historic. The rooms are basic, but clean and comfortable. Our trip was provided by Gourette Eaux Bonnes Tourisme in order to bring you this story. However, Luxe Adventure Traveler maintains full editorial control of the content published on this site. As always, all thoughts, opinions, and enthusiasm for travel are entirely our own. This article contains affiliate links. When you book on Booking.com or shop on Amazon through our affiliate site, we earn a small commission at no additional cost to you. Wow, the Wild Dôme looks absolutely spectacular, what a gorgeous place to stay! I wouldn’t mind to escape there for a weekend or longer 🙂 Looks like you had a fabulous time in the mountains! Beautiful shots, thanks for sharing! We’ve stayed in quite a few igloos and domes, but Wild Dôme has definitely been our favorite! The Pyrenees look like the place to be for skiing in France. Pic de Ger at Gourette is just stunning. It’s also nice to see that there is a wide selection of runs no matter what your skiing level is. Plus all those non skier activities, so much to do. But I really want to stay in one of those Wild domes!!! The Wild Dôme is such an awesome experience and the French Pyrenees are totally underrated. I love the fact that there are thing to do for non-skiers at Gourette too because although I’ve never been skiing, I feel that I wouldn’t be particularly good at it, so having other options is nice! I had never heard of Jambon de Bayonne before reading this post – that plancha looks like the perfect accompaniment to a glass of red wine! Tim loves to ski and I’m just terrible at it, so it’s always important to me that there are other activities available for the non-skier while he hits the slopes. Good to know that the Pyrenees are less expensive than the big name ski resorts in the Alps, thanks for telling us about Gourette. I’ve never been skiing or snowboarding, but I would love to book a week at a resort someday to take beginners classes. And I love that there are so many cool activities for the non skier … in case I fall on my face 😀 Grande Tyrolienne Zip Line sounds epic – and I would love to get aboard a groomer to head up to Cotch. I think I would go though just for a night in the Wild Dôme!! The groomer tour is really fun! Even more fun when you drive one. It’s not as easy as it looks. I love the idea of the Grande Tyrolienne zip line. It might even tempt me, though I’ve never done one! The groomer tour looks good too. And I know I’d be in La Bulle des Eaux-Bonnes too. 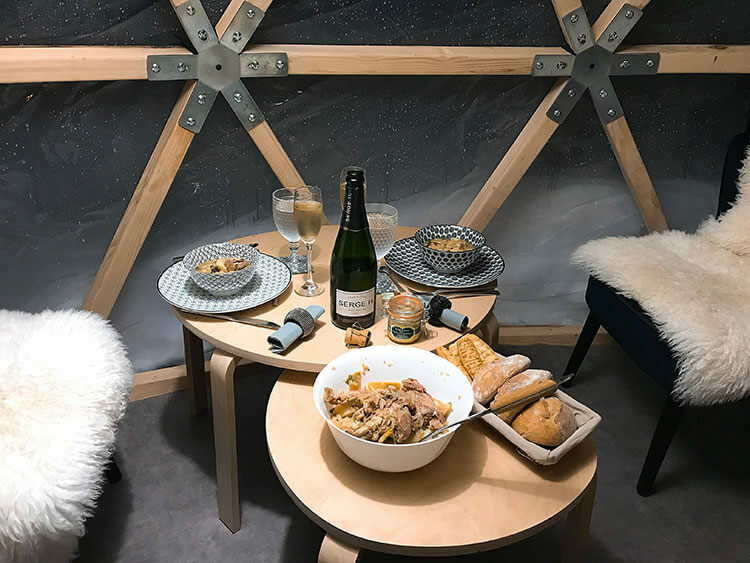 The wild dome looks pretty luxurious – my biggest angst with winter ‘igloos’ and the like is the lack of bathroom – problem solved here! Exactly! You get all snuggled up and warm, then have to go out in the cold to go to a bathroom. This is the first we’ve ever stayed in that actually had your own private bathroom right inside your igloo or dome. Hubby had a skiing accident many years ago and he never tried again. Yet we still love our trips on snowy mountains like this one: how cool that you can have a groomer tour!!! That’s a bummer to here. Skiing isn’t my thing, even though Tim loves it. You can definitely still enjoy winter in the mountains without being a downhill skier. I’ll admit, I’m not a skier, or snowboarder… so it was great to receive your non-skier tips! I have never visited the Pyrenees, despite staying often only 5 hours north of there. The food looks hearty and warming and perfect after a long day on the slopes (or a long day by the fire in my case), especially the Jambon de Bayonne! I’d love to stay in a wild dome at L’aventure Nordique village – having your own view of all those stars! You should definitely head down to the Pyrenees since you also live in the region, Hannah! We can’t believe it took us until our second winter living here in Bordeaux to go. We didn’t know what we were missing out on. What a great post. I couldn\’t believe how my adrenaline started rushing reading about those kilometer-long pistes. It\’s been too long since I hit the slopes, and this looks like the perfect place to get back into it. Plus those food photos now have me starving. I made it to Tignes a couple years ago, but I think Gourette just might be even better! 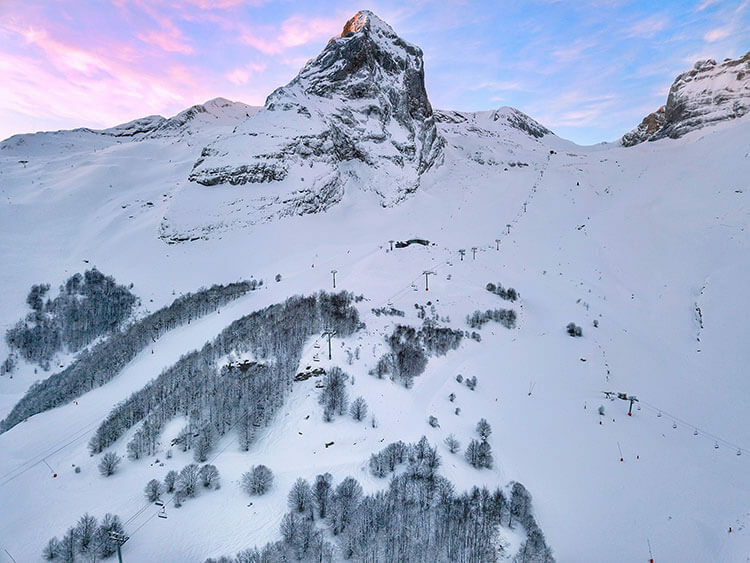 We’ve heard good things about Tignes, too. Though not this year – they got absolutely dumped on with an insane amount of snow! 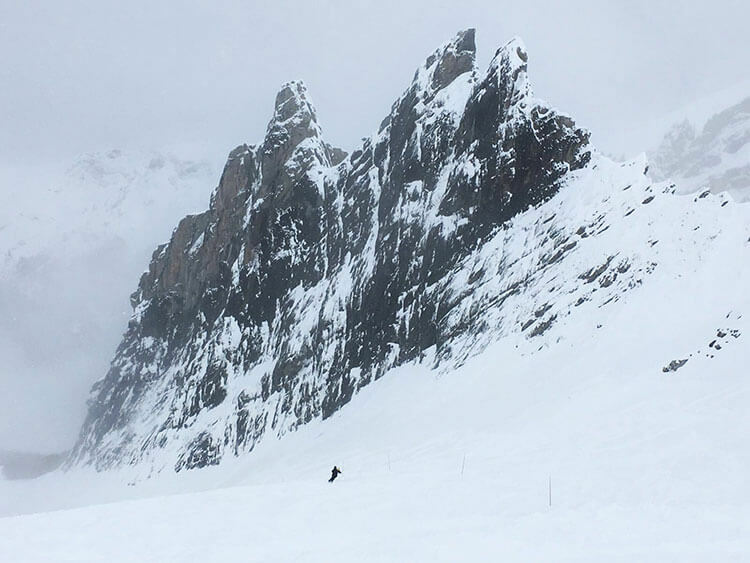 Great post and introduction to skiing in the Pyrenees. It’s true, the Pyrenees are much more accessible than the Alps, but more difficult to get to than the Alps! Love the food section, especially learning about Garbure and Ttoro. Have not spent enough time in the Pyrenees region, but need to. Wild Dôme looks spectacular. Love the lack of wifi connection…it’s about being in touch with nature. Saving this article!! 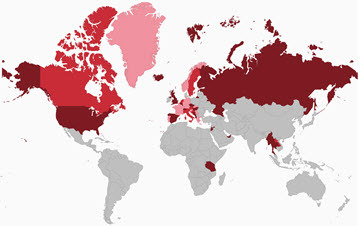 It’s true that for international visitors, it’s slightly more difficult to the Pyrenees than to get to than the Alps. International flights to Geneva make the French Alps pretty accessible, but if you know how to plan you can get to the French Pyrenees pretty easily from Bordeaux, Toulouse and even London. Haha! You’d be the biggest kid at Club Piu Piu. But lessons are available for adults. Neither of us had any experience with skiing until we moved to Europe and have had lessons in Italy, France and Switzerland. 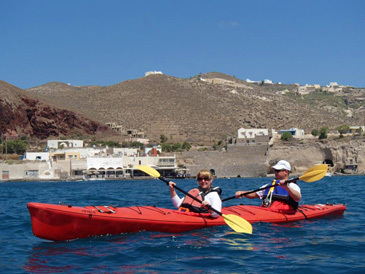 Instructors are very good and pretty affordable, even for private lessons. The French Pyrenees are on my bucket list for a while and I really hope t go there soon, Tim and Jennifer. Thanks for the motivating post. Is winter the best time of the year to explore Gourette? It depends on what you want to do in the mountains. If you want to ski and do winter sports, winter is the best time to go. But there is also hiking and a via ferrata that we’ll be checking out during the summer months.